Some of the factors that have an affect on climate, like volcanic eruptions and changes in the amount of solar energy, are natural. Others, like the addition of greenhouse gases to the atmosphere, are caused by humans. Some of the main ones are listed below. Climate can change if there is a change in the amount of solar energy that gets to Earth. Changes to the cycle of solar activity, called the 11-year solar cycle, can cause a small impact on climate, too small to be the cause of recent climate change. 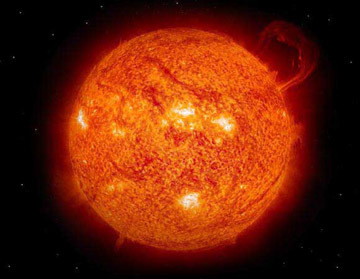 Over thousands of years, changes in the way Earth orbits the Sun can cause large changes in climate. When volcanoes erupt they spew more than hot red lava and ash. They release tiny particles made of sulfur dioxide into the atmosphere too. These particles get into the stratosphere and reflect solar radiation back out to space. This causes cooling. The cooling is temporary, lasting usually a year or two. Greenhouse gases have a strong affect on climate. These gases trap heat through a process called the greenhouse effect. While greenhouse gases are a natural part of the atmosphere, the amount has increased over the past 150 years as fossil fuels have been burned and the amount of forests, which naturally take up the greenhouse gas carbon dioxide during photosynthesis, has shrunk. Because the snow and ice of the cryosphere are light in color, they have a large albedo â€“ the ability to reflect most solar radiation back out to space. When snow and ice melt as Earthâ€™s climate warms, less energy is reflected and this causes even more warming. There are also other aspects of our planet that have an impact on climate too. Scientists are studying the impact of clouds and the impact of aerosols on climate. Scientist are studying the oceans too because melting Arctic sea ice could change ocean circulation, causing regional climate to change.